New Torus POWERBLOCK Isolation Transformers Target Midrange Market at InfoComm 2018 | KMB Communications, Inc.
Torus Power, maker of uncompromising, clean, isolation transformer-based power components for AV systems, will unveil a its new POWERBLOCK (PB) Series of toroidal isolation transformers at InfoComm 2018, June 6–8 at the Las Vegas Convention Center, booth N2834. With the introduction of the versatile, compact, yet rugged POWERBLOCK transformers, Torus Power brings a unique midrange product line that improves AV system performance and provides protection for small yet sophisticated commercial installations. Isolated Components Deliver Superior Audio and Video Quality and Protection POWERBLOCK delivers clean, uninterrupted power to commercial AV systems that don’t require the brawn of full-size Torus AVR or WM units. However, the PB Series still includes some of the very best of Torus tech. Time-tested technology such as surge suppression and noise filtering through proprietary narrow bandwidth technology (NBT) allow sophisticated audio-visual components to deliver superior performance. Audio comes alive with a lower noise floor, better dynamics, imaging and bass, and video is notably crisper with brighter colors, deeper blacks, and a more compelling overall image. The new POWERBLOCK PB 10 isolates outlet pairs to separate source components from power components for a cleaner signal, resulting in an enhanced audio video experience. PB 10 models are designed for 60 Hz markets using 120V and boast a small footprint weighing just 35 lbs, making them easy to fit in any system. 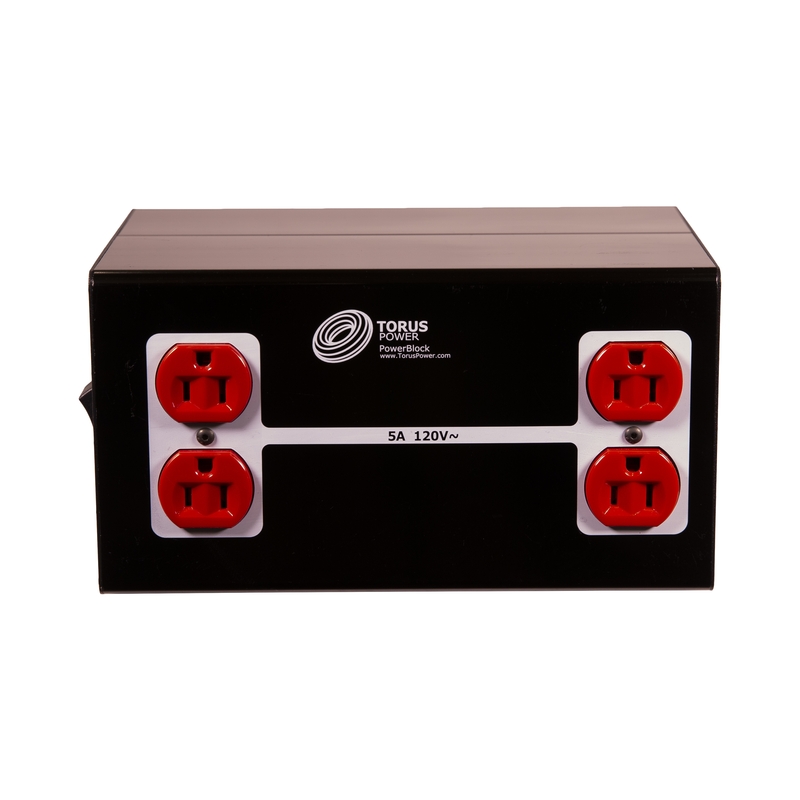 For smaller applications where it’s only necessary to protect a few source components, speakers, a TV, or a projector, the POWERBLOCK PB 5 offers enough outlets to plug in the most expensive AV equipment in a system, protecting these components and improving the audio video quality within a limited budget. Like its slightly larger counterpart, the PB 5 operates at 60 Hz with an input voltage of 120V, and weighs just 25 lbs. High-end projects demand the ultimate in power protection. Integrators can’t afford to leave equipment unprotected and vulnerable to harmful power conditions. But smaller systems also represent a significant investment. That’s why even POWERBLOCK uses a toroidal isolation transformer to physically decouple the equipment from the power supply, delivering safer, cleaner power for sophisticated AV systems with a substantially lower noise floor. Resulting performance benefits are noticeable, compelling, and appealing. To experience the Torus Power difference firsthand or to learn more about the new POWERBLOCK Series, remember to visit the Torus Power team in booth N2834 during InfoComm. Toroidal isolation power transformers by Torus Power are the world’s finest clean power source for audio, video, and control systems. Dramatically increasing performance levels of connected AV components from video displays to amplifiers and powered speakers, Torus Power products utilize Plitron Manufacturing’s patented NBT technologies and medical-grade toroidal isolation transformers to eliminate virtually all power-line noise artifacts and protect equipment from potentially damaging AC power line events, while increasing system reliability and extending product life. Torus Power products deliver higher levels of instantaneous current which ensures that dynamic components and high performance systems are never compromised, nor starved for power. Built to rigorous specifications under Plitron Manufacturing’s ISO 9001 quality control system in Toronto, Canada, Torus Power’s toroidal transformers—the heart of the Torus Power product line—utilize similar technologies as those found in leading AV amplifiers as well as in industrial, medical, broadcast, telecommunications, IT, power conditioning, and energy management applications. For additional information visit www.toruspower.com and follow Torus Power on Twitter and Facebook.